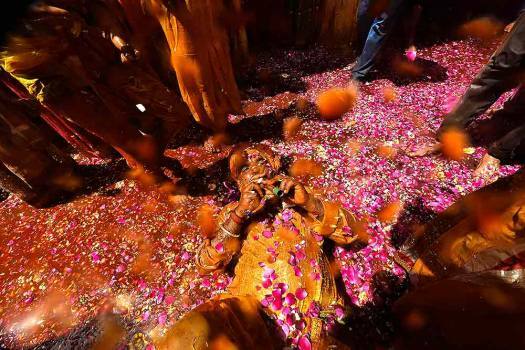 People celebrate 'Kodamar Holi', in Beawar. 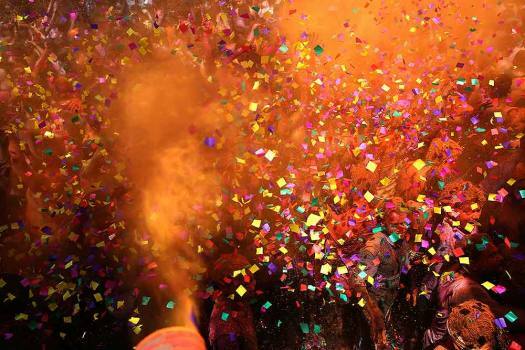 Revelers dance as colored powder and confetti are showered on them during celebrations to mark Holi, the Hindu festival of colors, in Prayagraj. 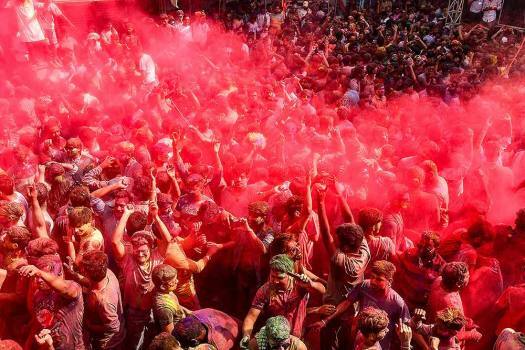 Revellers dance as they celebrate the festival of holi, in Prayagraj. 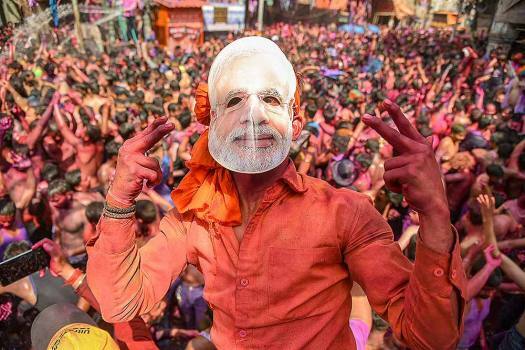 BJP supporter wears a mask of Prime Minister Narendra Modi during holi festival celebration, in Allahabad. Bollywood actress Katrina Kaif during Holi celebration in Mumbai. 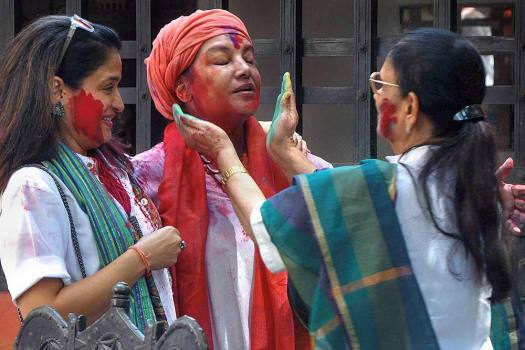 Bollywood actor Shabana Azmi plays holi during the Holi festival celebration, at her residence in Mumbai. 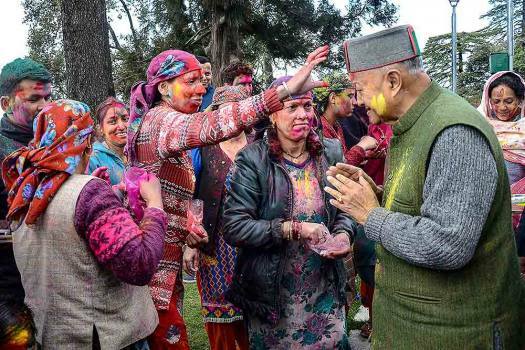 Former Himachal Pradesh chief minister Virbhadra Singh celebrates holi at his residence in Shimla. 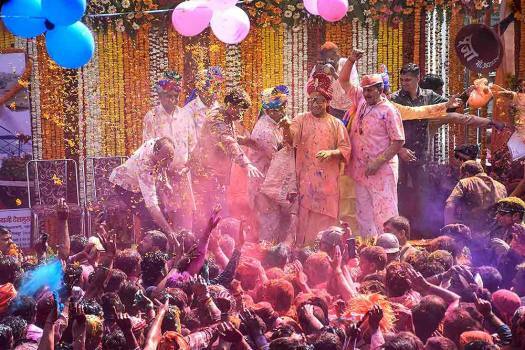 Uttar Pradesh Chief Minister Yogi Adityanath addresses the gathering during Lord Narasimha Yatra on the occasion of holi festival, in Gorakhpur. Young girls play in the mud on the occasion of holi festival celebrations, in Guwahati. 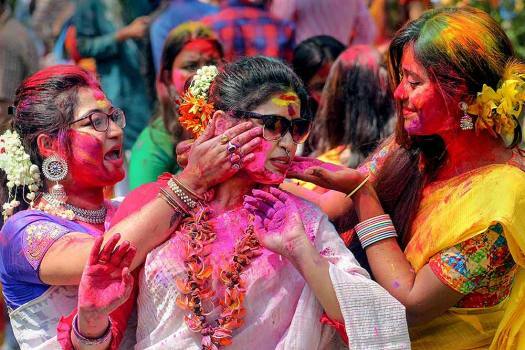 People apply colours as they celebrate holi festival, at Santipur in Nadia district of WB. 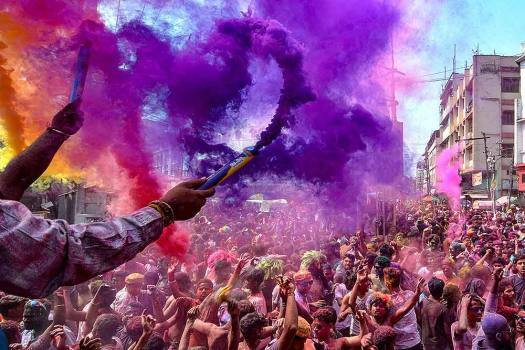 People play with colours on the occasion of Holi festival celebrations, in Guwahati. 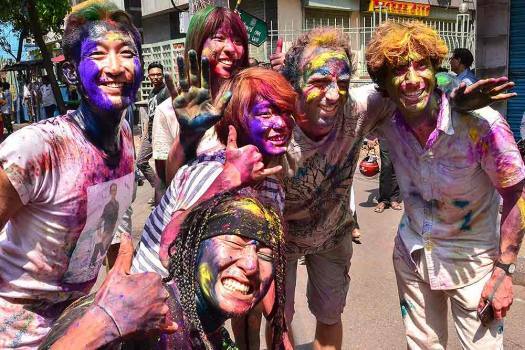 Foreigners play holi during holi festival celebrations, in Kolkata. 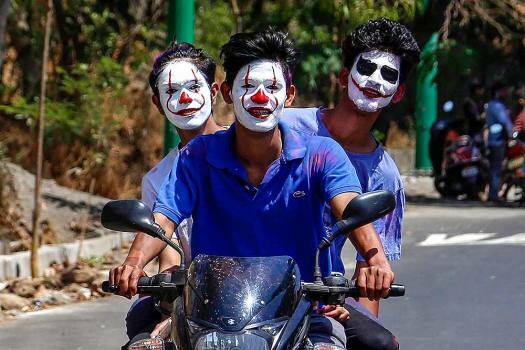 People paint their faces and ride a bike on the occasion of Holi festival, in Thane. 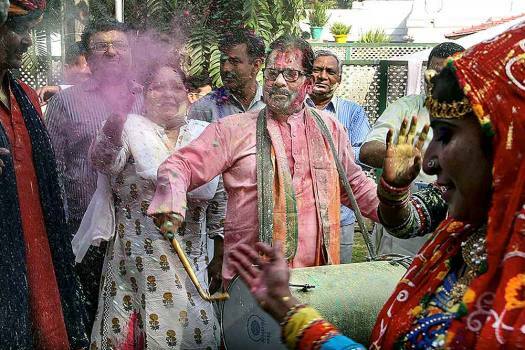 Union Minister of Minority Affairs Mukhtar Abbas Naqvi celebrating Holi at his residence in New Delhi. 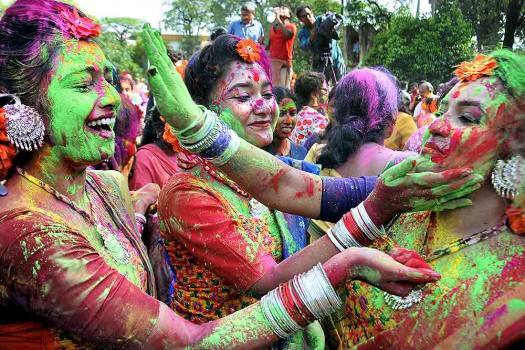 Foreigners celebrating Holi festival at Khasa Kothi in Jaipur. 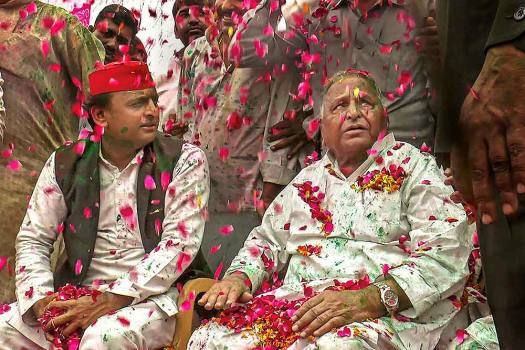 Samajwadi Party President Akhilesh Yadav with SP founder Mulayam Singh Yadav during Holi celebrations, at their native place in Saifai. 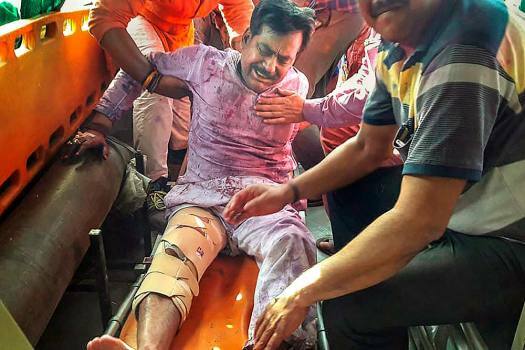 BJP MLA from Lakhimpur Yogesh Verma after he was shot by unidentified assailants, following Holi festival celebrations, in Lakhimpur. 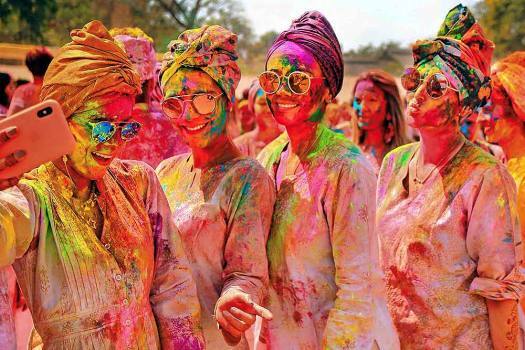 Tourists play Holi in Pushkar, Rajasthan. Students apply 'gulal' on each other during Basant Utsav on the occasion of 'Dol Jatra Festival' in Kolkata. "Delhi Chief Minister Arvind Kejriwal will not celebrate the Holi festival tomorrow as a mark of respect to the martyrs of Pulwama terror attack" the AAP posted on its official Twitter handle on Wednesday. No foul play is suspected, the police confirmed. According to police, the victim Neeraj Jatav, 16, was playing Holi with persons from other community when clashes broke out between the two sides at Bhiwadi town. 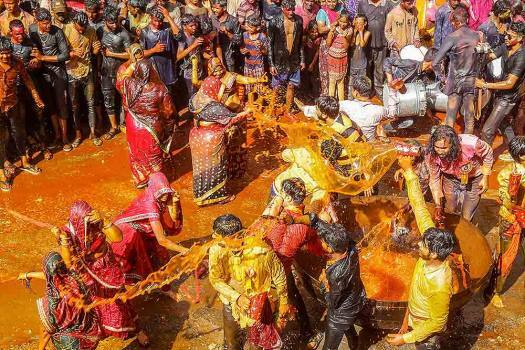 According to the report, local residents said Ashish had stopped these men from assaulting a boy for throwing water balloons on them a day before Holi. Metro feeder bus services will not be available for the whole day. "For all the tall claims of people, I had the example of Charlie Chaplin to prove that you don’t need an extra foot to gain stature in your chosen field," recalls actor Rajpal Yadav.